With the launch of JUMP service in the Bronx earlier this week, Bill de Blasio can finally say bike-share is available in all five boroughs. But he still can’t stake a claim to expanding bike-share as a real transportation option for New Yorkers. The mayor is tinkering with tiny experimental bike-share zones when he should be laying the groundwork for massive bike-share growth. Despite all the press conferences about dockless bike-share pilots, 2018 will go down as something of a lost year for bike-share in New York City. For the first time since Citi Bike debuted in 2013, a whole calendar year will come and go without expanding its core service area. The pilot zones for dockless bike-share are no substitute: They consist of only a few hundred bicycles covering small areas, and they don’t generate the network effect that makes good bike-share systems hum. 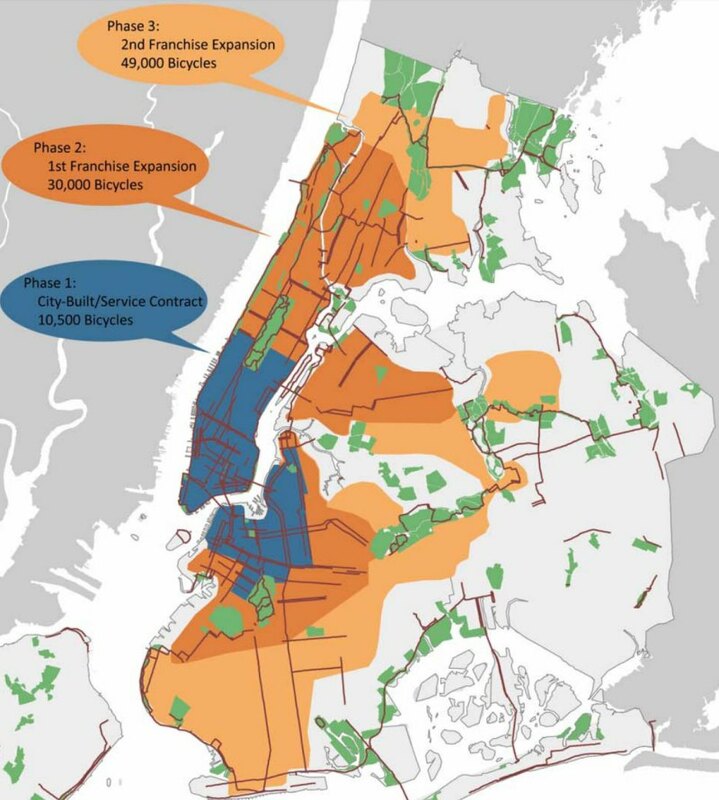 Nearly a decade after the Department of City Planning envisioned a network of 50,000 bicycles extending far into the Bronx, Queens, and Brooklyn, New York has a system about a quarter of that scale, with most usage concentrated in Manhattan. In fairness to City Hall, the bike-share field has changed rapidly in the past couple of years. Venture capital has discovered bike-share, Uber and Lyft are now players in the industry, and dockless operations are seen (somewhat warily) as the future, despite a dubious track record in American cities. It’s understandable if the city needed to pause and find its bearings. But soon there won’t be any excuse to hold back rapid bike-share expansion. By the end of this year, NYC DOT will have gotten a good look at JUMP, Lime, Pace, and dockless Citi Bikes. And with Lyft’s acquisition of trusty but relatively tiny Motivate, the enterprise in charge of Citi Bike will be a well-capitalized operation capable of scaling up dramatically in a short amount of time. The pieces are in place for a much bigger bike-share network in New York. This system could solve the bike-share shortage in Manhattan, wresting business away from Uber and Lyft cars in the congested heart of NYC (biking is, after all, faster than driving for most rush hour trips in Midtown). And it could expand bike-share access to most of the city — not with Mickey Mouse pilots but with one big contiguous service area offering ubiquitous bicycle availability throughout. Here’s how. Before Lyft acquired Motivate, it made sense to protect Citi Bike from venture-subsidized competitors that could undermine a successful, established system and then vanish when they failed to achieve lift-off. Now that Motivate has merged with one of the biggest speculative ventures of them all, that logic doesn’t really apply. If other companies can safely and reliably run bike-share fleets, they should get a bite at the apple. Let’s assume the city does grant long-term status to other companies from its dockless bike-share pilots. These companies should have access to the same territory as Citi Bike, and that territory should be much larger than the current Citi Bike service area. Lyft could veto this arrangement, because the city’s contract with Citi Bike grants exclusivity within its service area through 2029. But the prospect of a large territorial expansion might be enough to sway Lyft (and Citigroup, whose sponsorship underwrites Citi Bike) to trade away exclusivity. What you want to avoid is a Frankenstein bike-share system with different operators assigned to separate fiefs, where riders have to think about paying two fares to cross boundaries. A bike-share network this big would dwarf what New York has now, and in the U.S. at least, bike-share operations at such a scale are untested. Dockless bike-share companies in Seattle have struggled to maintain fleets a fraction of this size. New York will want to put in place some enforceable standards, much as it has with Citi Bike, to ensure the companies provide good service and don’t junk up streets with unusable bicycles. A mandate for fair bike distribution, so bike-share remains reliably available in low-income neighborhoods within the service area. Maintenance standards that guarantee a high share of bicycles on the street, say 90 percent, are in safe, rideable condition and visible in the company’s app. Open trip data and anonymized real-time bicycle locations published via the General Bike Share Feed Specification. Even if bike-share doesn’t get any bigger in New York, the city should embark on a program of massive bike corral expansion. Putting bike parking zones in the curb lane by intersections accomplishes a few important goals simultaneously: It makes the intersection safer because bikes don’t block people’s field of vision like cars; it prevents bikes from cluttering sidewalks; and last but not least, it gives people space to park their bikes. 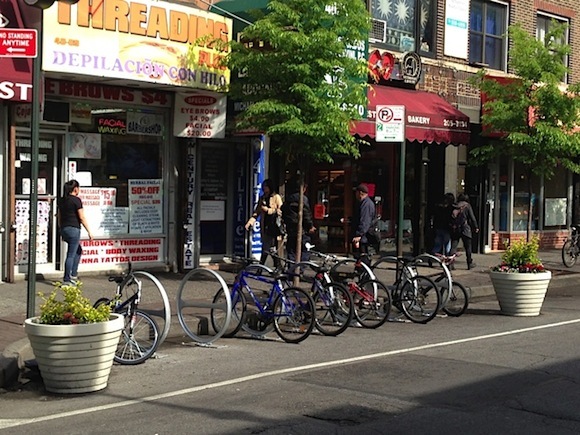 A bike corral in Jackson Heights. Photo: Clarence Eckerson Jr. If most of the next wave of bike-share expansion won’t involve docking stations, the imperative to add bike corrals gets stronger. All these new dockless bike-share bikes will need to go somewhere, and just like Citi Bike stations, the best place is the curb lane at street corners. Nominal fees collected from the bike-share companies can pay for these bike parking zones, but they should be open to personal bikes as well. The trick will be to do it at a scale commensurate with the expansion of bike-share without getting bogged down in tedious spot-by-spot fights at community boards. NYC DOT already managed to do something similar with the Citi Bike station siting process, and City Hall can go big on bike corrals if the mayor doesn’t get squeamish about repurposing parking spots. Bike-share is not an end unto itself so much as one piece in a broader strategy to improve the bike network for everyone. As Dallas is discovering, people won’t even ride bike-share if the streets are terrible for biking. Right now, DOT is making important upgrades to the bike network with its projects along the Queens Boulevard corridor, and it has a blueprint for safer biking in the Manhattan and Bronx neighborhoods around the Harlem River. But there’s a lot more to be done. In just the past few months, drivers have killed Carlos Vasquez, Aaron Padwee, and Xellea Samonte in separate crashes in western Queens and the South Bronx. With or without bike-share, City Hall has to make the streets in these neighborhoods safer for bicycling. Bike-share can help accelerate the process. It generates safety in numbers and grows the constituency for bike lanes. If City Hall goes big on bike-share, it has to ramp up the rest of its bicycle program too. The City is failing to deal with big unresolved questions: should/will/can NYC subsidize bike share with cash? Does Motivate/Lyft want a cash subsidy or is it concerned City will attach impossibly difficult conditions? Has DOT had an honest discussion with de Blasio about where huge numbers of dockless bikes are supposed to park? Streetsblog reports that de Blasio does not want to expand Citibike because he worries there will be huge push back over taking car parking for Citibike stations. Where does City Hall believe dockless bikes will park? Already crowded sidewalks on streets with retail storefronts? Corrals that take the same space as Citibike Stations without the proven benefits of a dock based system? And, lastly, I’m one who thinks it’s a shame that Lyft bought Motivate. Citibike’s future has become tangled with the bitter fight over a cap on app hail fleets and minimum pay for drivers. Is City Hall going to be in the mood to work hand in hand with Motivate/Lyft while Lyft is funding attacks on City Council and City Hall policy initiatives? I think all the dockless bike companies will eventually settle into just a few major players. Like how ofo largely pulled out of the US market. Lime seems the mostly stable and reliable nationally. Since citi bike is entering the dockless world, I could see the Citi Bike docked system in the more dense parts of the city and dockless citibike as one gets further out, but its still one system preserving continuity. That could then be supplmented with companies like Lime and Jump for example. Also would add some competition to keep eveyone on their toes in terms of service. Once you start approach 10 companies like in some cities it can be too much. While I like seeing this explosion of bike-share, and bike-share talk, I am also disappointed at the lack of interest in bike ownership. I’ve been trying to sell a very cool Univega for the last two months. No interest whatsoever. If a business wants a bike corral and DOT determines that the site meets its technical criteria, the business should get it without DOT having to go before a transportation committee. If DOT identifies a street without a bike lane and decides to install a class 2 lane, which takes no parking spots, it should be able to just do it the next time it repaints the street. A docking station that takes two or three car parking spots and replaces them with parking for 20+ shared bikes? This also shouldn’t have to go before the community board. Not sure what the general rule would be, but if fewer than, say, 5 to 10 parking spots will be affected on an average block and there’s no real change to the geometry of the street or the traffic pattern, there should be no need for DOT to jump through the current hoops. The nice thing about the Citi Bike process was they didn’t seek approval. They selected sites based on feedback at open meetings and then told the CBs what they were going to do. Most of that happened before de Blasio was mayor though. Agreed. But they still went to boards and did lots of outreach. That was necessary then, especially because it was a relatively new concept and they were dropping dozens of stations at once, but may not be now. They shouldn’t have to even hold open meetings for this stuff anymore. Community board advice is useful. Community board vetoes are not. As I note, Citibike should be allowed to propose incremental expansion into community districts adjacent to their existing service area. There are plenty of places in Windsor Terrace and far South Slope where stations could be placed without the loss of any parking are needed sidewalk space, thanks to the wide sidewalks along Prospect Park and the way the Prospect Expressway slices through the grid. From there, Citibike could start expanding opportunistically down into Sunset Park. Is there such a thing as open-source docking? Such that the City, say, would own/manage/maintain the docks, and then any and all companies that wanted to participate could operate fleets that would be standardized in some way to be compatible with a standardized type of dock? You could have lime bikes and ofo and citibike all at the same docks. This would mean that many streets would go car-free. Many streets would only be ped/bike/bus. Other streets would only have access for commercial loading/unloading and no private vehicles. It would be a whole new set of priorities and would transform the city. There would be no more streets that prohibit commercial vehicles and are only for private vehicles. Every street design would consider pedestrians, bicycles, buses, commercial vehicles, & private vehicles – in THAT order. Major problem with bike corrals is that currently the city does not maintain them , just like they do not maintain sidewalks. So our tax $ are going to sanitation for cars but not for bikes parking and pedestrians. A Fundamental policy issue that must be resolved. For seamless transportation, IMHO, a single system is better than a patchwork . Am I going to need two or three subscriptions ? How do I park my Citibike in an area which has only dockless service ? Will I be hit with surcharge? The tourists are going to be totally lost. Clearly we need an availability map that includes every service but the interoperability issues are numerous . How will the rebranding work with dockless? Agreed that bike corrals at every corner makes all the sense in the world. But as mentioned below, bike corrals are still not maintained by the city, so sanitation will have to step up to the plate on that.and De Blasio will have to get out of the way..
we are probably better off with the well maintained docking station.. looks more like a predictable transportation hub, than a dockless which is more like an individually owned vehicle. We will take all the dockless bikes and dump them at city hall . Plenty of room there. Six months into his second term, Bill de Blasio became the first New York mayor since Ed Koch to be recorded riding a bicycle, or at least the first one to leave a record that Google image search is capable of retrieving.